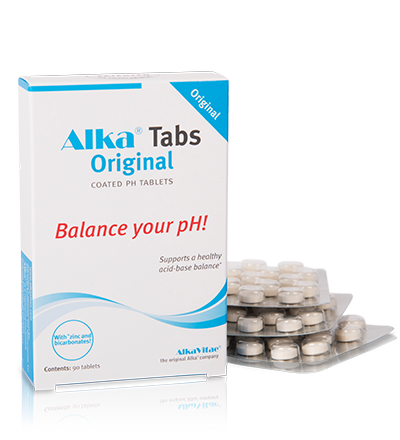 Alka® Tabs Original are tablets to effortlessly alkalize your body every day. The tablets are made of a patented combination of sodium bicarbonate and potassium bicarbonate, with a special gastro-resistant coating. The bicarbonates which are gradually absorbed through the gut wall help to release and neutralize build-ups of acid waste. Taking a tablet every day after eating alkalizes your body! The original, patented Bicarb-Balance formula! Dissolves gradually in the intestines and not in the stomach! The ideal sodium-to-potassium ratio for a neutral moisture balance. Also combines perfectly with Alka® Drops! Get started straight away and discover the unique alkalizing effects of Alka® Tabs. Sodium bicarbonate is an essential ingredient for alkalizing the body. 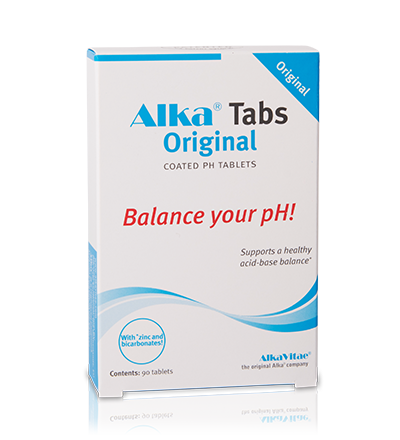 Alka® Tabs gives the alkalizing properties of sodium bicarbonate, yet without allowing it to react with gastric acid. This gastro-resistant coating ensures that the tablet passes straight through the stomach unchanged so that it can dissolve in the intestines. The proportions of sodium and potassium in Alka® Tabs are also the same as the proportions associated with a neutral moisture balance within and between cells in the body. The ideal sodium-potassium balance means you can take Alka® Tabs every day. Alka® Tabs come in a convenient blister pack, so you take it with you anywhere. 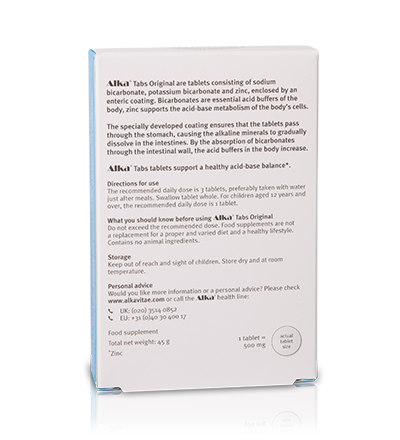 The Alka® Tabs formula has been successfully sold worldwide for more than 12 years. Alka® Tabs is the original formula, developed according US patent no. 5914130. Ingredients: acidity regulators (potassium bicarbonate 40%, sodium bicarbonate 15%), thickener (xanthom gum), bulking agent (cellulose, hydroypropylcellulase, maltodextrin), anti-caking agent (tricalcium phosphate, silicondioxide), glazing agent (hydroxypropylmethylcellulose, glycerol, talc), stabiliser (magnesiumstearate), mineral.